Wilderness on the Roof of the World in the heart of Himalayas: yaks, mastiffs and wild as well as not so wild Tibetan animals. Yaks – kings of the Tibetan plateau. Once upon a time wild yaks were widespread in the entire Himalayan area of Tibet, northern India, Nepal and Bhutan. Today the small and vulnerable population of wild yaks is scattered in most remote areas of Himalayas where they can still find habitat undisturbed by humans. Like many other wild animals - their existence is severely threatened by lost of natural habitat, by competition with domesticated yaks and diseases transmitted by them. Regrettably soon we may be only able to “meet” wild yaks in old books and movies. Actually a heard of wild yaks may be very dangerous. When galloping the heard moves very fast with the crushing effect of a steamroller, so may be reading it in a book is a safer option then facing a herd of wild yaks …. 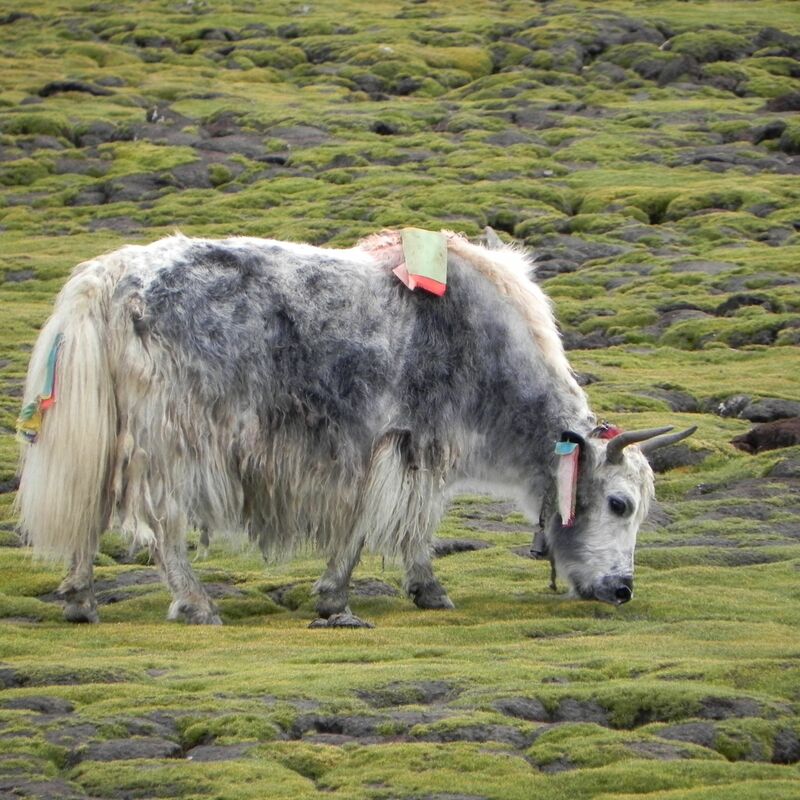 Please think a bit seeing how little they need (lichens, moss.....) and how much they offer to us.... Yak should be recognized as one of the most Generous Animals. Yaks' natural habitat lies at high altitudes – somewhere between 3000 m (9,800 ft) to 5500 m (18,000 ft). They are very well adapted to low level of oxygen, low temperatures and scarcely available food at high elevations – stunted grass, herbs, lichens which is about all that nature offers at these elevations. Despite little available food and tough climatic conditions in their habitats, wild yaks are the largest and heaviest animals belonging to the bovid family (with cattle as a very close relative). Their long and thick outer hairs of brown or black color covering a dense undercoat of soft hairs provide an excellent insulation from the freezing temperatures. Contrary to the wild yaks, the domestic yaks are thriving since long. No wonder since “early times” they were domesticated by inhabitants of otherwise uninhabitable mountainous areas and high elevation plateaus. The truth is that even now, for large populations of inhabitants yaks are providers, contributors and sources of almost everything needed to sustain life at high altitudes. On top of providing milk, meat and fiber they were commonly used for transport of merchandise in areas where no other animals will survive. The way loaded yaks travel narrow mountainous paths closely following their footsteps is almost legendary. 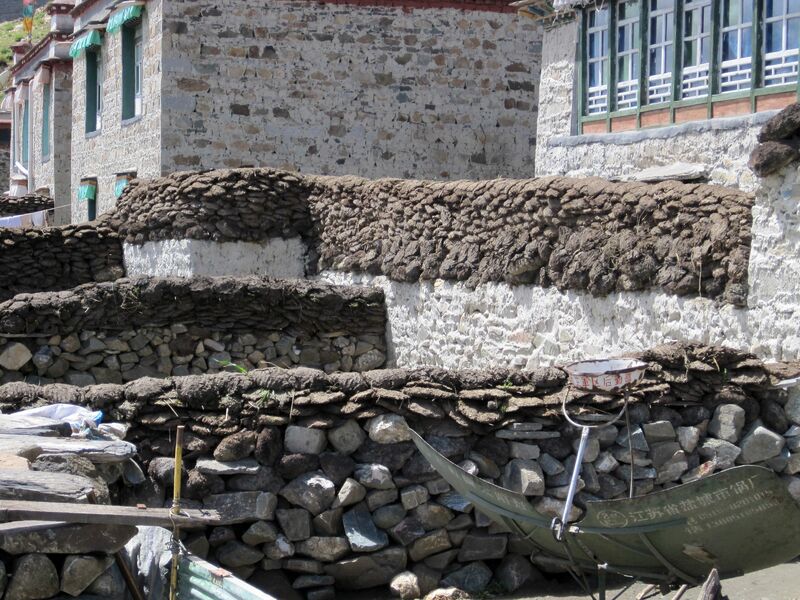 Less know may be fact that even now dried yaks’ dung is an important and sometimes the only fuel available on this high treeless Tibetan plateau. During short summer time you can see on Tibetan plateau characteristic “pizzas”- like flat dung pieces drying attached to walls or piles of already dried ones. But even that is not all – yaks skins were the main components of Tibetan yurts for centuries making homes for nomadic people. Those settled in lower elevations used yaks for plowing the soil. The butter made from the yak’s milk is a very precious element of Tibetan life till these days. It is used as an ingredient of a “butter tea” – the famous and very popular drink consumed there in large quantities (although I’m a tea lover, I was not really convinced to the butter-tea throughout my journey to Tibet). Also, the yak’s butter is largely used in religious festivities in all kind of burners (lamps) in gompas in front of statues of Buddha. And believe me, the yak’s butter is not only highly appreciated but also an expensive offering in Tibet. 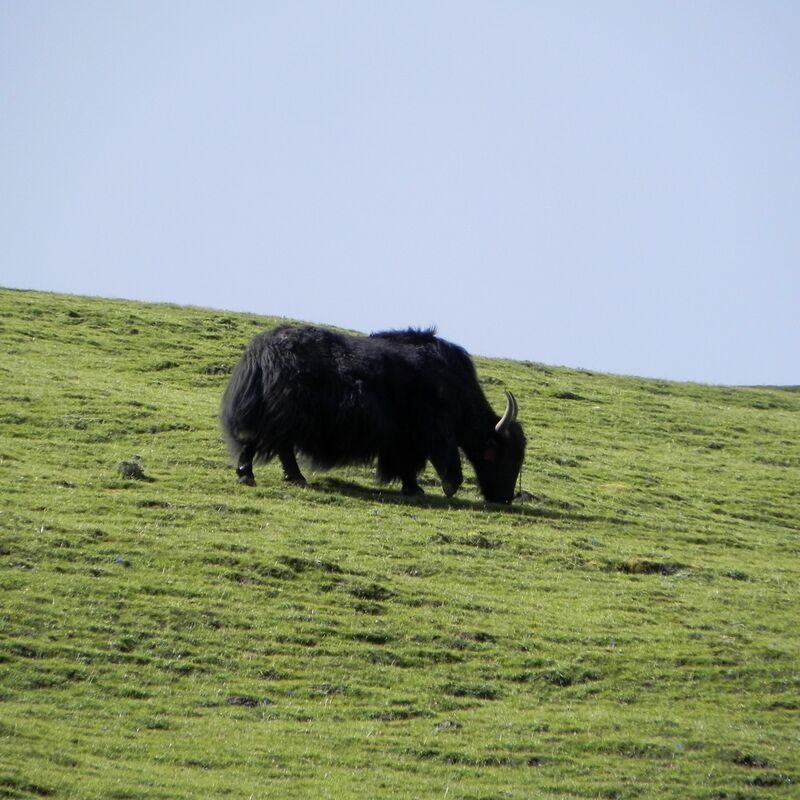 Domestic yaks are visibly smaller than their wild “cousins” (about half the size). Unfortunately due to the cross-breeding with cattle they lost many of characteristics shaped over millennia by the nature. Phenomenon unseen in the wild - domesticated yaks can be also white. Although they look like “dignified” animals (kind of “yak’s aristocracy”) they are simply “human-made” hybrids tailored to our needs against the wisdom of nature (similarly to the Zoo’s population of white tigers and lions). 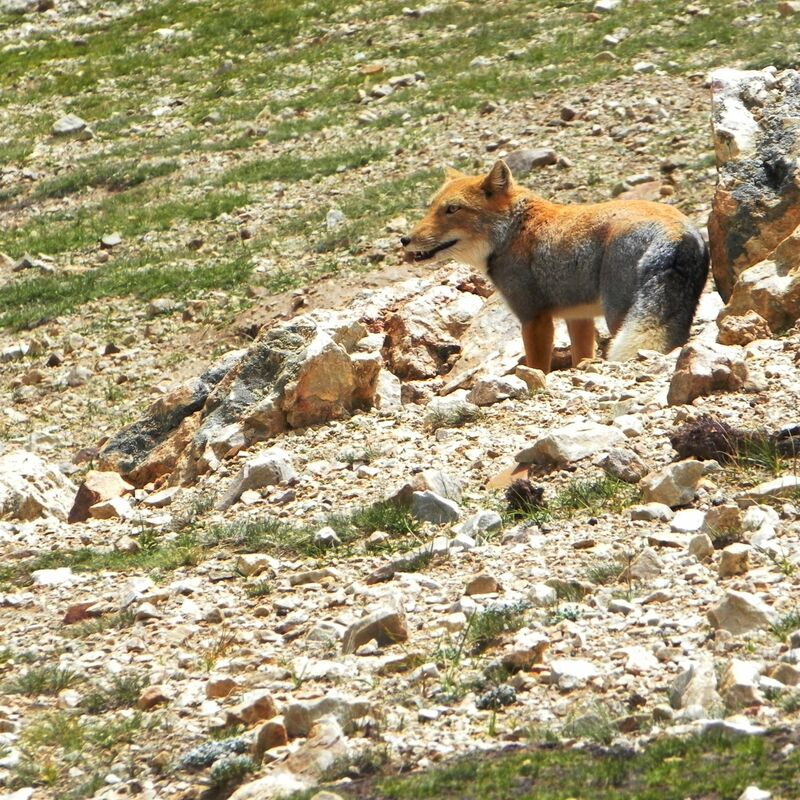 If you consider the size of the Tibetan plateau, its seemingly endless “emptiness” and rough landscape it may easy to understand that despite the abundance of wildlife, you may not find wild animals at each corner (may be because the Tibetan plateau doe not have that many corners? :-). 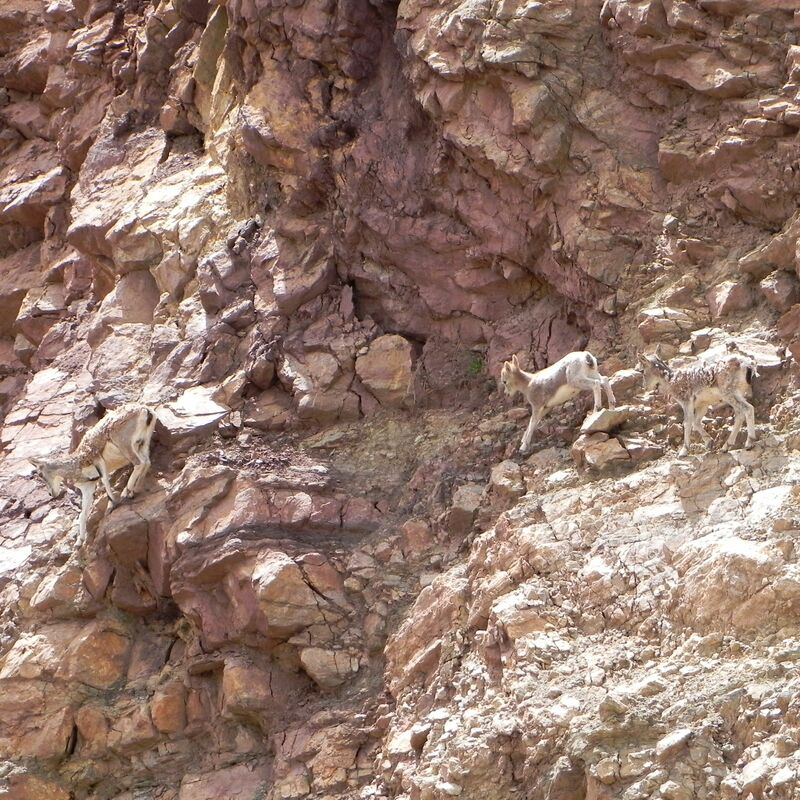 I considered myself lucky when meandering along the vast deserted areas I spotted a herd of mountain’s goats. You may admit looking at these pictures that by giving them colors and shades of the background landscape the Mother Nature made them literally invisible. 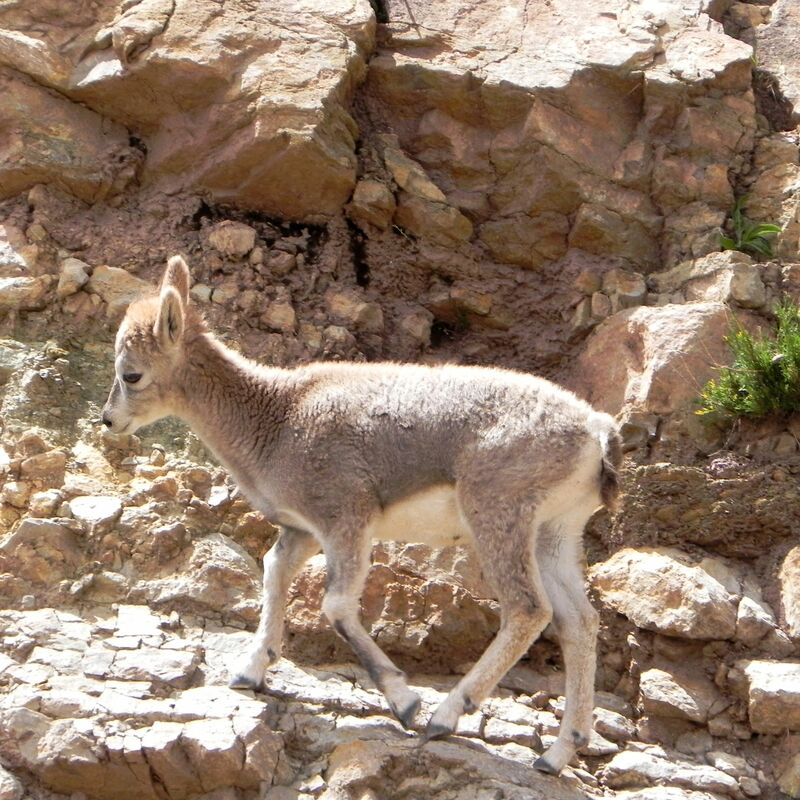 Honestly, it was much easier to spot a Tibetan fox hiding behind the rocks then these shy goats. Look at the characteristic shape of its hairy tail and larger than usually amount of hair on its neck. Tibetan dogs are considered as ancient breeds genetically diverged from wolfs much earlier than their western cousins. Due to the omnipresent wilderness and climatic conditions of the Tibetan Plateau they retained several “primitive” instincts required for survival. 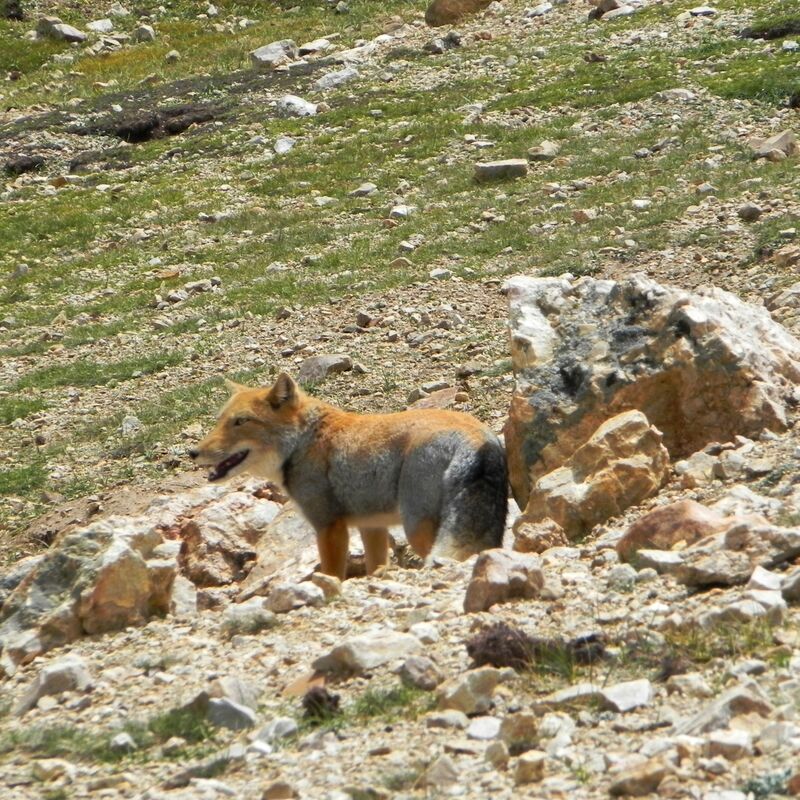 They have a lot of “social intelligence” similarly to wolfs (like pack behavior). They are more strong-willed and non-obedient than most of their domesticated western cousins. The pure breed Tibetan dog is known as Tibetan Mastiff. Once you are in Tibet, it is almost "a must" to get close and personal with the majestic Mt. Everest.